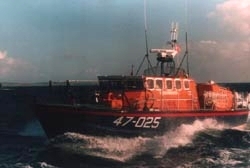 Built by the Cowes Boatyard of Fairey Allday Marine, she was a 47 foot, Tyne class, steel hulled, self-righting lifeboat costing £560,000 in 1988. This was the last boat to be launched from the Brims lifeboat shed, ending with a special ceremony to mark the end of an era on the 11th September 1999, a large turnout of islanders and well-wishers were there to witness this event. 1989 Adaption work carried out in order to accommodate the Tyne Class lifeboat, which was placed on service early 1988. This included the installation of a new fuel storage tank, the extension of the slipway bilgeways and replacement of the bottom sections of the slipway keelway channel. 1991 Crewroom and toilet facility constructed in the roof space of the boathouse. 1999 Coxswain Ian McFadyen and the crew of the Lord Saltoun were awarded a letter of thanks from the Director of the RNLI for their service to the multitanker Ascania on 19th March which was carrying a cargo of the highly explosive vinyl acetate. She was disabled by a fire in the engine room and was drifting dangerously close to the Caithness coast in strong tides and a westerly gale gusting force 10. During the service station mechanic John Budge fell and broke his leg and was landed in Scrabster for treatment.